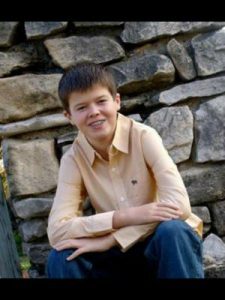 For the first fourteen years Cole M had lived an average life; he was healthy, ornery and loved being with his friends watching or playing sports or video games. He’d started complaining about muscle and joint pain and we thought it was just from growing and puberty. Over Thanksgiving break of 2012 Cole came downstairs with a knee about four times it’s normal size so we took him to our pediatrician. He referred us to a rheumatologist and we discovered on February 8, 2013 that Cole had Juveline Arthritis. As parents, we thought arthritis was just for old people, but boy were we wrong! Cole went through quite a few medications until we seemed to find the perfect regimen for him. Up until this diagnosis, Cole had never even swallowed a pill. He was now required to swallow many pills a day and have a weekly injection in his leg. Things had changed, but Cole was doing well. He quit many of his sports because it was painful during and after with joint pain and swelling. We settled into our new medicine filled life and Cole was feeling good, for awhile anyway. In early December 2013, Cole started dropping a lot of weight, sleeping all the time and complaining about not feeling well. After a few weeks we scheduled an appointment with the Rheumatologist on December 27th. The Rheumatologist was shocked because Cole had lost over 15 pounds in a month and had a great amount of discomfort in his stomach. Dr. Swenson, the Rheumatologist, ordered a CT Scan to be done. On January 2nd, 2014 we went to the hospital in Mason City and had the CT Scan completed. The next day Dr. Swenson called and said the Radiologist believed that Cole had Crohn’s Disease. Our heads were spinning and of course, we started researching right away. On January 7th we went to Mayo Clinic to meet with a Pediatric Gastroentologist, Dr. Stephens. Dr. Stephens ordered a endoscopy and colonoscopy to be done as soon as possible which was January 10th. We had this procedure completed and they weren’t able to do it quite as successfully as they normally can, but they got enough biopsies to confirm that it was Crohn’s Disease. We had a follow up appointment with the Gastoentologist to discuss how his treatment would change. Some of the medications used to treat arthritis also treat Crohn’s Disease since both of these are autoimmune diseases so the medications sometimes work the same. We did need to add one medication that Cole received at our local Cancer Center. It is a three hour infusion called Remicaid that is used to build up in your system and if all goes as planned, you only have to get it every eight weeks. Everything did not go as planned! From this point on Cole was in an intense amount of pain. He would cry at night, not sleep, not eat well and he wasn’t attending school full days due to pain. This went on for WEEKS! As parents this was one of the hardest things of our lives watching our child suffer and for Cole (the one in pain) it was no cakewalk either. Cole was only able to attend six full days of school from Winter Break to February 14th. Many return calls were made to Mayo. Our hope was that following each Remicaid treatment Cole would feel better. The morning of February 10, 2014 we were at our wit’s end with watching him suffer. I called up to Mayo and they ordered another CT scan to be done immediately after Cole’s Remicaid treatment that day. So at 5 p.m. we went for the CT Scan. From the moment this scan was over I could tell something wasn’t right. The nurse who helped us required us to wait at the hospital and she was very nervous and not able to make eye contact. We did not leave the hospital from the scan until 6:30 p.m. and she sent a copy of the images with us because she believed we would be going to Mayo soon. I had a PTO meeting that night so left my phone on my desk. When I returned I had 13 missed phone calls from the doctors; they needed Cole admitted into the hospital immediately. They even offered to send an ambulance. Lance and I drove Cole up after waiting for someone to come take care of our little boys. We arrived in Rochester after 10 p.m. on February 10th. Cole’s CRP (or infection level) was 125; normal is 8 or below. He was a very sick boy. The CT scan showed his stomach was filled with abscesses of infection. One of the abscesses was quite large and trying to poke through the bladder. This was the most painful abscess for Cole. Unfortunately because he was so filled with infection they couldn’t tell what was causing the abscesses. Cole spent five days at St. Mary’s Hospital in Mayo on IV antibiotics. Each day we saw that CRP level drop, but the pain was still there. On our last day Cole was given a PICC line in his arm in order to get antibiotic treatment at home. This was traumatizing for Cole and he was very nervous about it. It did prove to be a lifesaver though and prevented many needle sticks for him! 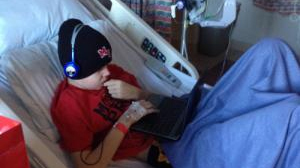 Since Cole’s discharge on February 14th he has had two more CT Scans and two more Remicaid treatments. He has been feeling so much better. Since his discharge; he has slept through every night, gained 20 pounds back and attended school everyday other than appointments! We are so thankful to MTW for helping with our gas, parking and food expenses. Since January we have made the drive to Rochester over twelve times and it is two hours each way. Having MTW help with these expenses has released some of the worry and burden on our family. Our medical bills and especially prescription bills have piled up and we are better able to focus on just paying those. We can’t thank MTW enough for their help.